One direct application of our mCerberus® MCB-100 device is with the monitoring of Steeger Braiders. Steeger Braiders are the braider of choice in the Medical Device industry used for the braid reinforcement of composite tubing utilized in interventional catheters. 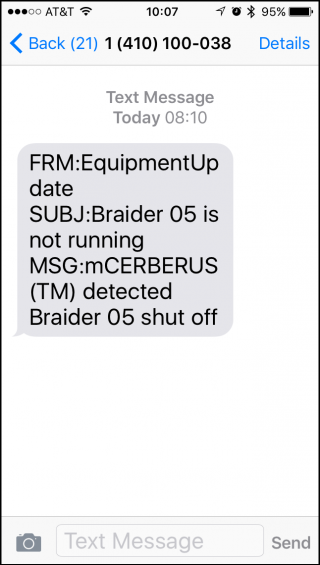 The mCerberus® MCB-100 device finds practical use for monitoring a Steeger Braider when the Engineer or Technician wants to be notified if and when the braider “shuts down” for any reason. For example, the Technician can be alerted immediately on the weekends when a Braider running unattended shuts down due to a broken braid wire, empty bobbin, or due to a power interruption. At this point, the System is enabled. When the braider shuts down, the mCerberus® MCB-100 will detect the Steeger Braider OFF condition within thirty seconds. Your phone carrier (AT&T, Verizon, etc) will typically deliver a text message to you within 60 seconds.